This post is sponsored by and in collaboration with Blue Lizard. We all believe in different beauty tactics. Every single day, I do a full skincare routine. I exfoliate my face 1-2 times a week, I do a mask at least once a week. The list goes on and on. Whatever it is you believe it, is going to be the routine you follow. At some point, a routine is no longer tedious and actually turns into a fun regimen. Every since I'm been writing here on the blog, I have always preached the importance of sunscreen. The sun is not your friend. At this point in my life, I have wised up to learn that baking in the sun and getting burnt is not something I should be aiming for every weekend. Naive old me back in the day was camping out at the beach from 11 AM to 5 PM, wanting to get burned because I knew it would turn to tan. I can't say it enough, don't be that person! Blue Lizard Australian Sunscreen comes from the gorgeous country of Australia (a country I still have to visit!) Location and climate make it tough for skin to escape the heat. Because of the rough conditions throughout the country, the sunscreen is some of the highest, most demanding sunscreen. The formula is held to a "higher, cleaner, safer and more responsible standard." The sunscreen is mineral-based which is ideal, given there is one specific for the face, as well as the body. This past weekend involved temperatures as high as 109 degrees Fahrenheit. The occasion? A local Tucson blogger pool party, so I couldn't pass up the opportunity to meet everyone and have a good time. Before I went out int he pool and in the sun, I made sure I lathered myself with sunscreen on both my face and body. This is a true testament to the quality, but I did NOT get sunburned and I always get sunburned when I go into the extreme temperatures here in town. One of the main differences when it comes to these sunscreen is the minerals used to make the formula. 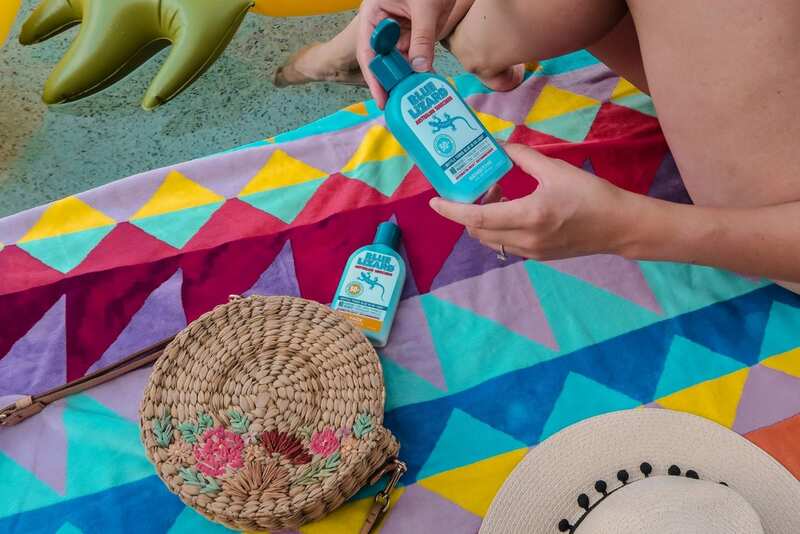 This Blue Lizard Australian Sunscreen has a natural, not chemical, mineral base. Zinc Oxide is a key mineral in the formula which is a doctor-trusted natural ingredient providing broad-spectrum protection from UV rays. Chemical sunscreens soak into the skin and absorb the sun’s rays after they’ve entered the body. Mineral-based sunscreens, like Blue Lizard Australian Sunscreens, act like millions of tiny mirrors on top of your skin and reflect most of the sun’s rays BEFORE they enter your body. Since my skin is so incredibly sensitive, I gravitated to the sensitive formulation for my body. Honestly, any extra ingredient in any given product can cause a reaction on my skin, so it's important to me to use only the best products. This formula is lightweight and rubs into the skin easily. Now when it comes to sunscreen, I do like the differentiation between face and body. Products going onto the face need to be more gentle with less ingredients than those on the body. That's just my humble opinion. The face sunscreen is much gentler, in comparison, which is perfect. Do you understand the importance of sunscreen? Do you apply every single day? ...I don't play when it comes to that beaming star in the sky. I need to make sure my skin is protected and that I don't age faster. Not to mention I don't want to get skin cancer, or have skin issues anytime soon. I cannot stress the importance of wearing sunscreen every single day. Many people believe that when it's foggy, you don't need sunscreen. This is definitely not the case and in most instances, you actually need more sunscreen on overcast days as the sun is even stronger through the clouds. Needless to say, wear sunscreen every single day. Find a good one, like Blue Lizard, and stick to it because it's going to protect you even in 110 degree weather like it did for me!